What does a lot size of 72X70X99X45X26 even mean, and how large is it? If you look at the "Lot Size" field, you will see a set of numbers. If the numbers are something like 100×100, it’s easy: a square lot with each side measuring 100ft. But 72x70x99x45x26? Which side is which dimension, and what is the total overall size? Let’s start with the basics. Standard convention says that the street side is the first dimension listed, and then the other dimensions follow clock-wise. For example, if you have a lot size of 60×130, the street side measures 60ft and the lot goes back 130ft. Continue reading What does a lot size of 72X70X99X45X26 even mean, and how large is it? 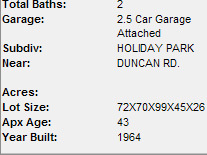 Posted on June 4, 2008 January 15, 2014 Author MariyaCategories Buying, Information, SellingTags dimensions, lot size, map, plat3 Comments on What does a lot size of 72X70X99X45X26 even mean, and how large is it?